Is it time to buy a reading lamp? You find your child reading under the bedclothes with a torch! You turn out the light..but find it back on in the morning! Where is the best place to position a directional lamp? Ideally a reading light should be positioned behind your shoulder. If you are right-handed position it behind your left shoulder and if you are left-handed position it behind your right shoulder. This way, your hand won't cast a shadow over the words as your read. Try and combine a direct light ,given from the lamp, with a general light from above. A way to control light levels, is to make sure you have a dimmer switch. While searching for a reading light for my youngest son, I stumbled upon these devine children lights - they certainly have the "WOW" factor don't they! 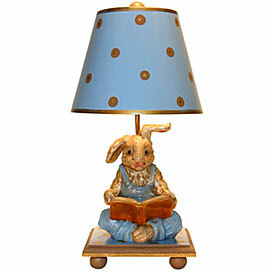 You can find this reading lamp in our Phonics Store....too cute for words! Make it comfortable, warm and inviting. A simple beanbag, large cushion or comfy chair will do. Make sure there is enough light and plenty of storage to store all those books. Encourage them to store books with the spine facing outwards so they can (and you) can read the titles easily. It looks tidy and makes it easier to choose books. When they are older they may enjoy sorting them in alphabetic order, or in different heights etc. You need to set the example. Let your children see how much youlove reading. Remember to read to your children...don't stop just because they can read by themselves!